Paper Stamp Scissors: The Stork is Coming! 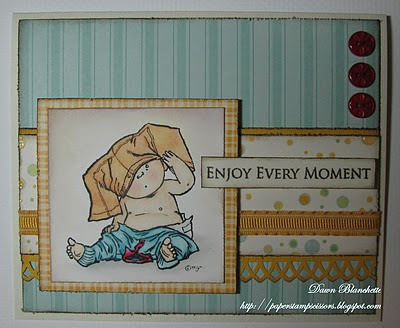 Today I have a card to share that I have created for the Scrapbooker's Paradise Playing in Paradise Challenge. I believe this is a new challenge in blog land, making its debut this week. To kick things off, we were challenged to create a project in their colours - green, gold (yellow) and a touch of burgundy. As there are new babies on their way in my family, I decided these would be nice gender neutral colors to make a card to welcome a new little one. I think it ended up being a little masculine, so hopefully one of the babies is a boy. I used vanilla cardstock for the base and the papers are from DCWV's Nana's Nursery Baby Boy stack. 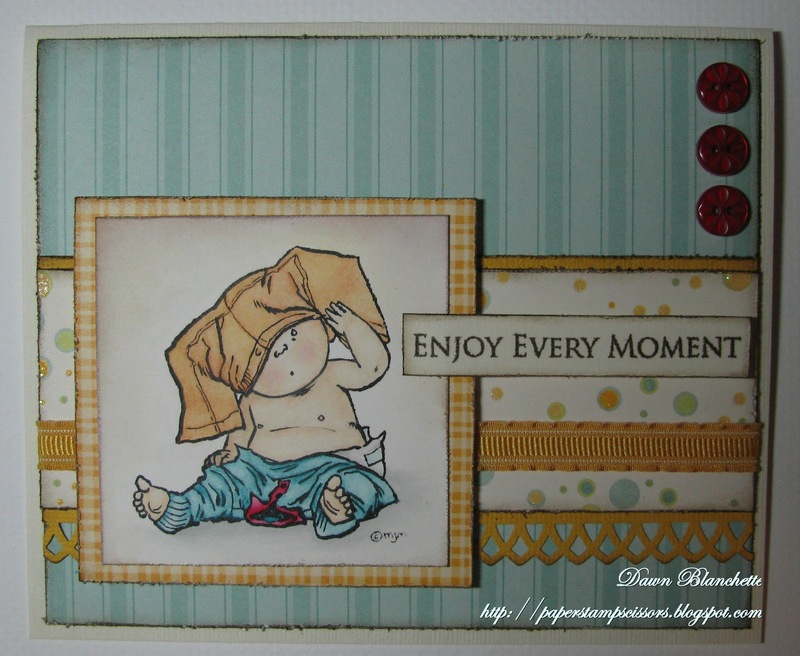 The adorable image is a Mo Manning design from Stampavie. I have colored it using watercolor pencils. The sentiment, which I thought was perfect for the image is from Close to My Heart. The buttons are from Stampin' Up, the ribbon is from a local scrapbook store (I do not remember the maker), and the edge punch is from Martha Stewart. Hope you like it! Good luck to all the gals who played along! Terrificly cute and fun...love that sweet image! Thanks for playing at Scrapbooker's Paradise. Awww... this is so sweet Dawn! Great colouring of the image and beautiful design! Awww.. this is SOOOO cute, Dawn! I love the little stamp! :) Thanks so much for playing with us in Paradise! Adorable card! That is such a sweet image! Thanks for playing along in paradise with us!